Two hurricanes are bearing down on the Hawaiian Islands, but many Bay Area vacationers had no idea of the impending weather as they waited to take off Wednesday afternoon. As hurricanes Iselle and Julio churn toward them, some Hawaiian stores are running short of storm supplies, like batteries, flashlights and bottled water. Meanwhile, at San Francisco International Airport, United, American and Hawaiian airlines are suspending fees they usually charge for changing tickets. 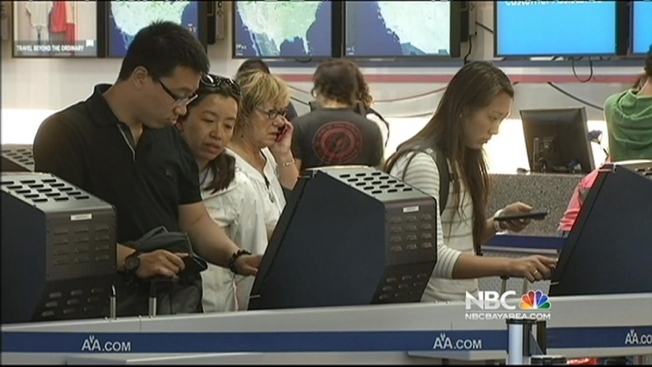 But passengers NBC Bay Area spoke with were unaware. “This is a surprise,” said Sara Bylund, who’s from Sweden, visiting San Francisco, on her way to Hawaii. Forecasters predict most of these tourists will have a wet, windy time, but when you’re at the airport with your family heading to your first trip to Honolulu… What’s a little hurricane? “I don’t think it’s a big problem,” Liu said. The last time a hurricane hit Hawaii was 1992. Hurricane Iniki slammed into Kauai. There hasn’t been another in 22 years, and there have only been eight names storms hit the islands since the 1950s.